On each side of the famous Arch at Washington Square Park stands George Washington in two distinct poses: Washington At War on the East side of the pedestal of the Arch and Washington At Peace on the West. The Arch was designed by by noted period architect Stanford White(1853-1906). Originally built in wood (and standing half a block away from its current location) for the Centennial of Washington’s inauguration in 1889, it was then commissioned in marble and completed in its current location in the early 1890’s. About the figure of Washington At War, in her book, “It Happened on Washington Square,” Emily Kies Folpe writes that the sculptor Herman A. Mac Neil “intended the figure” “to appear alert and intent, as if watching the maneuvers of his army.” Behind Washington are the “allegorical” figures of Fame and Valor. 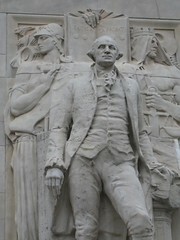 Pictured in this photo (above) is Washington At Peace (A. Stirling Calder). Behind Washington are figures representing Wisdom and Justice. Wisdom stands there as “the modern Athena” (Greek goddess of wisdom). And then we come to the figure of Justice. Folpe writes, “Justice, draped and crowned, holding a balanced set of scales with one hand and an open book in the other. The pages of the book are inscribed with the words ‘Exitus acta probat.’ ” Exitus acta probat, I’ve learned, is taken from the George Washington Family Coat of Arms. So what does “exitus acta probat” mean exactly? It’s Latin and I’ve come across various ways of interpreting it, all similar but slight variations. The basic translation is: the outcome justifies the deed. It’s the pairing of that statement with the figure of Justice that puzzles me. And I like to think at Washington Square Park that ultimately there will be some kind of ‘Justice’ in what transpires in the design and outcome of the Park. The scales have been unbalanced to date. I wonder if there is some message there for those of us who’d like to see a different outcome at Washington Square Park (other than the city’s “vision” for it). Is there some missing deed? Of course, Stanford White’s “outcome” was a little bit jarring. He was shot on the roof of the Madison Square Garden building (the second incarnation – no longer there) by the husband of an ex-lover. Madison Square Garden also being a building he designed.